Divine became deaf because of an illness when she was very young. Her parents are very poor farmers and are unable to fully meet her needs. she needs a sponsor to help cover the cost of her education and basic needs while attending the new school. Please pray for her as the world of learning is opened up and she learns of the gospel (probably) for the very first time. Savera was born in 2013. She has been deaf since birth. Savera's parents are poor farmers. She needs a sponsor to help cover the cost of her education and basic needs while attending the new school. Please pray for her as the world of learning is opened up and she gets access to the gospel (probably) for the very first time. Jacqueline was born in 2012. She became deaf after an illness when she was very young. Jacqueline's parents are poor farmers. She needs a sponsor to help cover the cost of her education and basic needs while attending the new school. Please pray for her as the world of learning is opened up and she has access to the gospel (probably) for the very first time. Nadine was born in 2012. She has been deaf since she was 4 years old. Nadine's parents are poor farmers. She needs a sponsor to help cover the cost of her education and basic needs while attending the new school. Please pray for her as the world of learning is opened up and she has access to the gospel (probably) for the very first time. Florence was born in 2003. She became deaf after an illness early in her childhood. Florence has health struggles. Her father is deceased and her mother is a poor farmer. She needs a sponsor to help cover the cost of her education and basic needs while attending the new school. Please pray for her as the world of learning is opened up and she has access to the gospel (probably) for the very first time. Evelyne was born in 2001. She has been deaf since birth. Evelyne's parents are poor farmers so she needs a sponsor to help cover the cost of her education and basic needs while attending the new school. Please pray for her as the world of learning is opened up and she learns of the gospel (probably) for the very first time. Roger was born deaf and blind, but he was recently able to get cataract surgery and can now see for the first time in his life. Roger's parents are poor farmers. He needs a sponsor to help cover the cost of his education and basic needs while attending the new school. Please pray for him as the world of learning is opened up and he gets access to the gospel (probably) for the very first time. Desire was born in 2003. He has been deaf since birth. His father passed away and his mother left the country. Desire was left with his grandmother who does not have the financial means to fully provide for him. 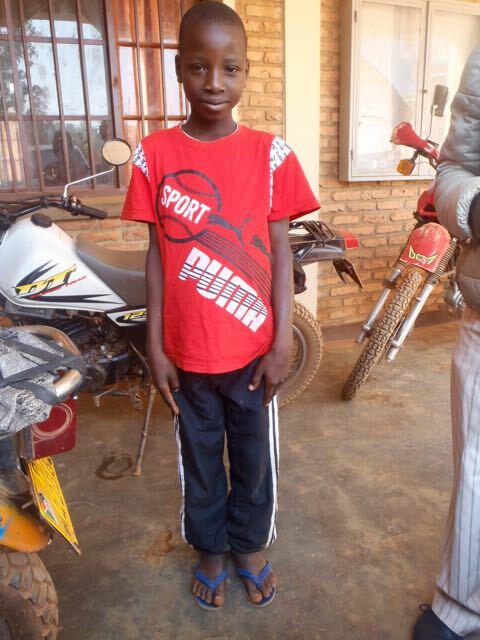 Desire needs a sponsor to help cover the cost of his education and basic needs while attending the new school. Please pray for him as the world of learning is opened up and he gets access to the gospel (probably) for the very first time. Thierry was born in 2011. He has been deaf since birth. His parents are poor farmers. He needs a sponsor to help cover the cost of his education and basic needs while attending the new school. Please pray for him as the world of learning is opened up to him and as he gets access to the gospel (probably) for the very first time. Edissa was born in 2010. She has been deaf since birth. Her parents are poor farmers. She needs a sponsor to help cover the cost of her education and her basic needs while she attends the new school. Please pray for her as the world of learning is opened up to her and as she gets access to the gospel (probably) for the very first time. Josiane was born in 2004. She has been deaf since birth. Her parents are poor farmers so she needs a sponsor to help cover the cost of her education and basic needs while she attends the new school. Please pray for her as the world of learning is opened up to her and she hears the gospel (probably) for the very first time. Donatien became deaf after an illness when he was just a baby. His parents are poor farmers. He needs a sponsor to help cover the cost of his education and basic needs while attending the new school. Please pray for him as the world of learning is opened up to him and he hears the gospel (probably) for the very first time.